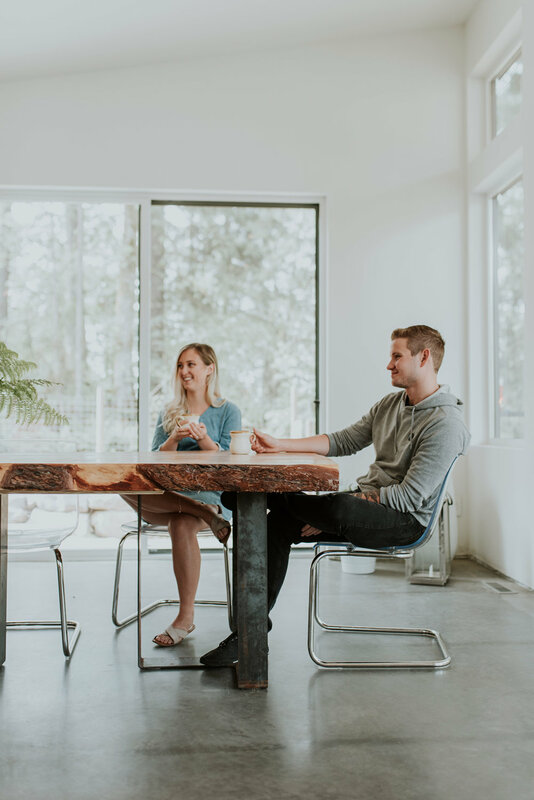 Meeting at their close friend’s home off Dewdney Trunk Rd we hopped out of our cars and caught a ride up the steep gravel drive with Myles and Courtney, the Baristas and owners of Jack Coffee Bar. As we travelled up the gravel road it became clear why they chose this spot for our session. We were surrounded by trees and wildflowers, the air was clean, and the house in front of us had massive windows to let in natural light. It was simple, woodsy and natural; just like their brand. Settling in, Myles began to pull out their pour over essentials: a chemex which they brew out of and a gooseneck kettle, its skinny spout for pouring precision. They then pull out two beautiful ceramic mugs they purchased at Spruce Collective last year, their favourite mugs for camping, beach fires and using just at home. After Myles freshly ground the Ethiopian beans from Bows X Arrows, he carefully measured the grounds before pouring them into the filter. As the kettle started to whistle, Myles began to extract the coffee from the ground beans by delicately pouring the hot water into the filter. Once the brewing was over, the sweet aroma of coffee filled the room and we made our way over to the table for a few still moments. After moments of quiet, we head outside to take in our surroundings and stroll down a nearby trail. The mountains were peaceful, pairing perfectly to the smooth dark roast in their hands. As their cups drew close to empty, we then headed back inside for final sips and to clean up. TFV – What are you known for in the community? What is your business? JC – We’re a coffee catering company. You can find us at various community events providing guests with coffee. We’re known for our coffee, and the experience that should go with it. Coffee brings people together, whether it is morning coffee at home with your spouse, going out with a friend, or having a business meeting. While we love having coffee at home, and hanging out at local coffee shops, we wanted to provide a unique experience. 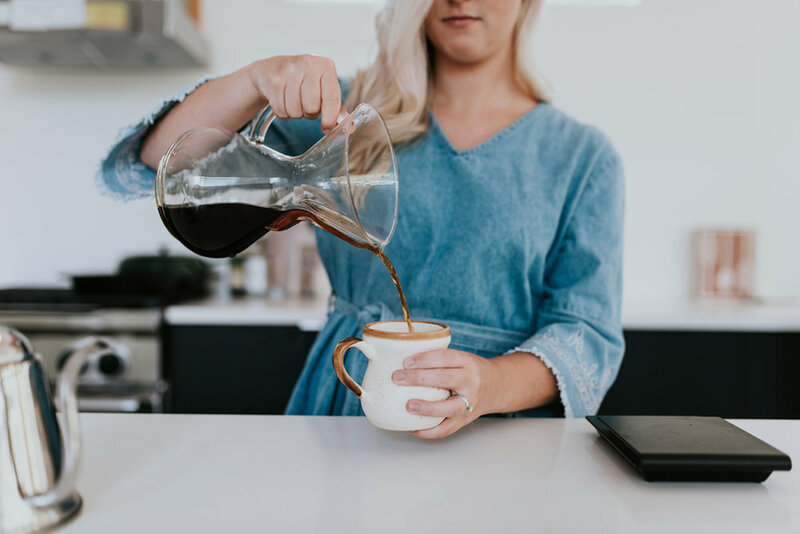 Because we chose to bring that coffee shop experience into intimate events, we are able to provide coffee at weddings, corporate gathering and several other occasions. We love that we get to be a small part of so many people’s special days. TFV – You’ve been working together for 2 years now. Do you have any advice for young entrepreneurs that you wish you had known starting out? JC – There is nothing more important than building genuine relationships and friendships with people in the community. Cheer the people around you on, and be sure to have fun with what you’re doing- you are creating this career for yourself after all! Be authentic and take the time to get to know the community around you, and the rest will fall into place. We realized this quickly being a part of a community that took us in with open arms! TFV – During our visit, you mentioned how the trick to pour over was all in the extraction. Could you share more about that and its process? JC – Our coffee program is simple but precise. We measure and weigh every variable to provide the most consistent cup. Even the smallest detail, such as the consistency of the grind, will make the biggest difference in extraction. TFV – What is your favourite part of brewing coffee at events? JC – We have gotten to meet so many people over these past couple years which has led to community collaborations, seeing past brides/grooms at their friend’s wedding the following season and of course, we love serving a product we can’t go a day without! TFV – How do each of you take your coffee? JC – Black. Light roasted coffee – we tend to gravitate towards bright Ethiopian and Kenyan coffees. TFV – Tell us a little bit about your life outside of Jack Coffee. JC – We love taking advantage of the growing culinary scene in the Fraser Valley. 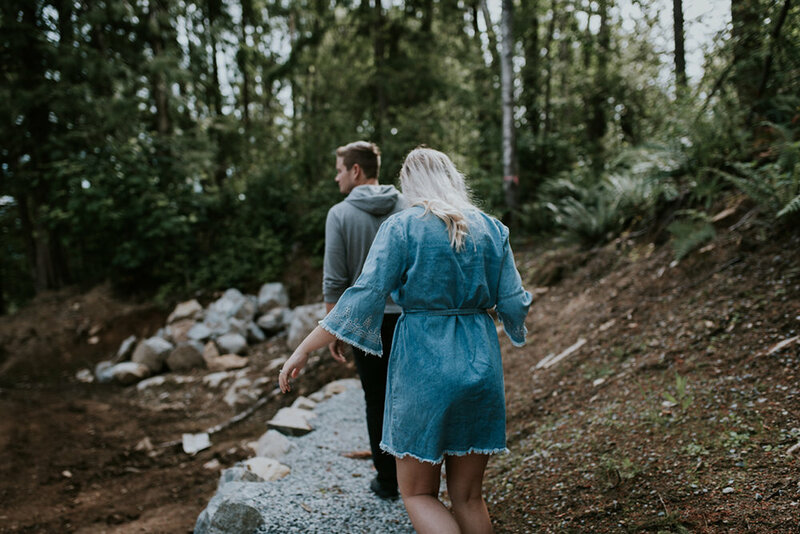 Even Downtown Abbotsford alone has grown tremendously in the past few years and we truly love visiting the restaurants and shops run by local business owners. We also take a camping trip down the coast each summer. There is nothing like unplugging and sitting around a campfire on the beach. This has become a little tradition for us the past few years and it’s the best way to reflect, recharge and gain new perspective for where we are headed next. We hope to continue going back for many more years! TFV – If you were graduating High School right now, what would each of you do? JC – We really can’t imagine our lives any other way! Everything we have done has shaped us and lead us into the position we are in. We believe in enjoying the journey. TFV – Who are a few of your favourite locals to follow on social media? TFV – What is your favourite season here in the Fraser Valley? JC – Summer and fall. BC is so bright and beautiful during those times of the year and we can’t get enough of it! There really isn’t anything more beautiful than a BC summer. We love the long, bright days. Summer is the time of year that we are busiest with weddings and special events. All of the planning and preparation we do in the winter pays off in the summer time. We also love the transition into fall: the crisp air, colourful trees and warm drinks. The coziest season of all! TFV – If you could recommend one place in the Fraser Valley, what would it be? And why? JC – The Vedder River. It’s a perfect place to cozy up around a fire, or for Myles to spend a morning fishing with friends. Not to mention, it’s beautiful. Be sure to stop at a local shop for some drinks and treats to go! TFV – If you were a destination, where would you be? After we gathered all of our things, we climbed into Myles and Courtney’s Jeep. As we drove down the long windy road, we continued chatting about where to grab the best breakfast sandwich in Downtown Abby. As the car began to slow down, with mouths watering we joked about how we would see each other soon, in the breakfast line up.